All photographs by, and copyright of, the Author unless otherwise stated. 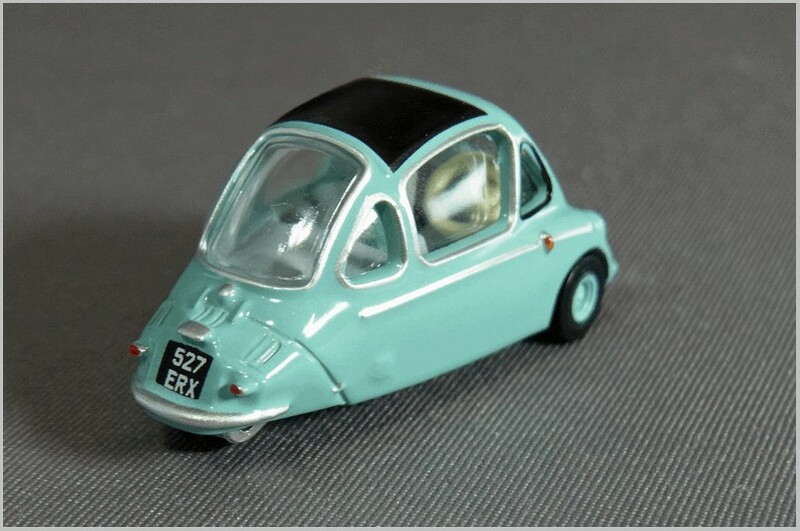 The latest Oxford Diecast Bubblecar in 1:76 scale is the Heinkel Trojan. 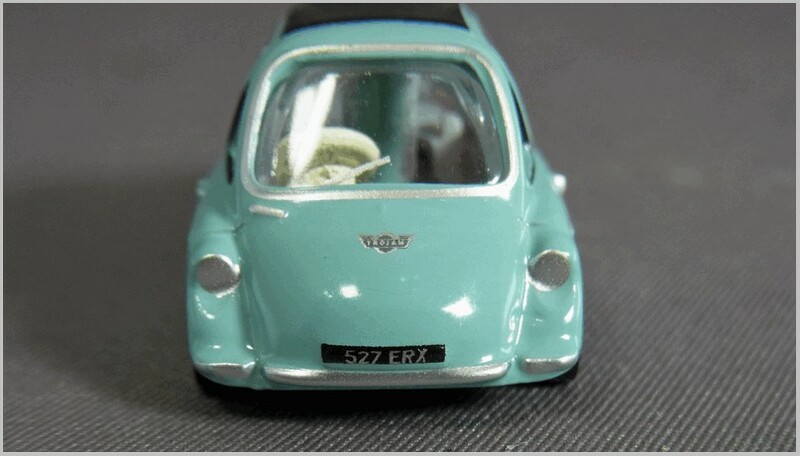 This is diecast in China for Oxford in the UK. 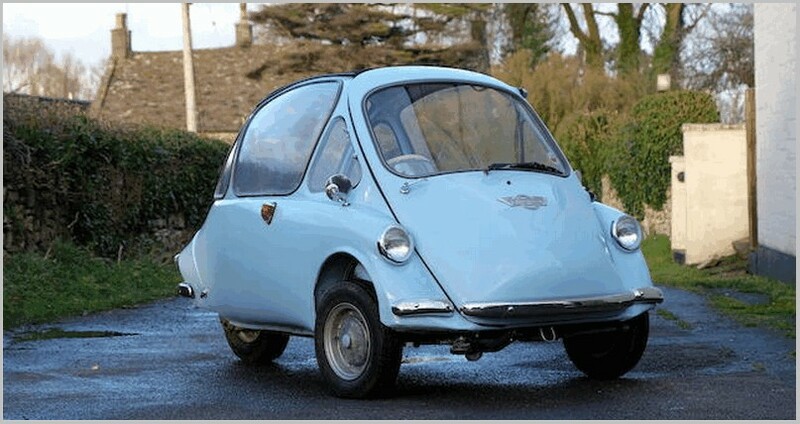 Launched in 1956 the Heinkel initially used a 175cc four stroke engine which was later enlarged to 200cc. 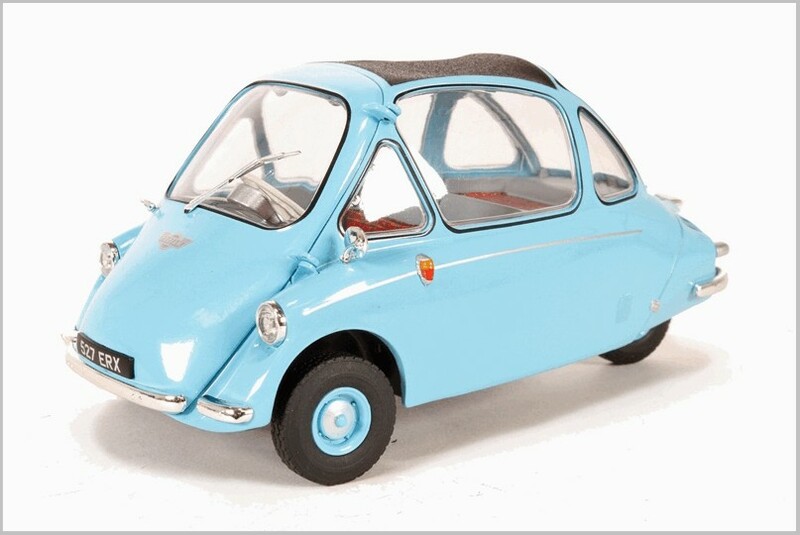 It was lighter and roomier than the rival BMW Isetta as it had a monocoque construction. 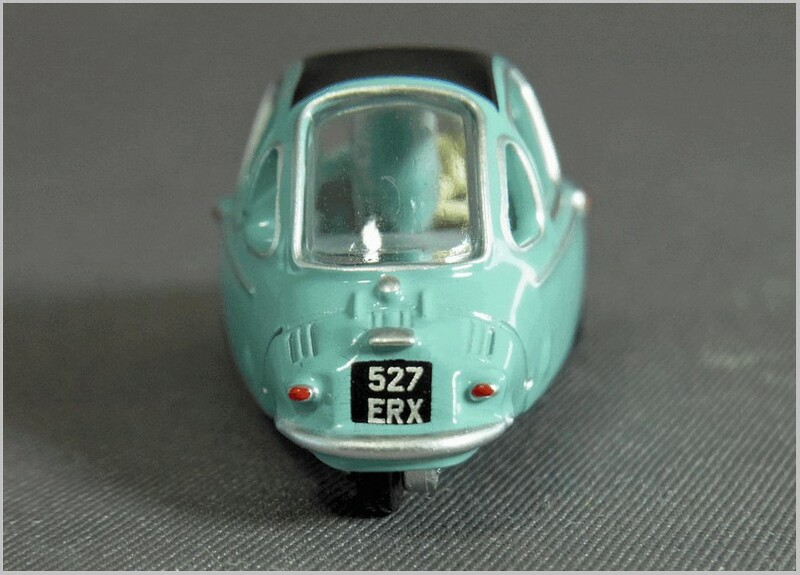 It also boasted a reverse gear but the steering column was fixed as the Isetta system which folded out with the door was patented and could not be used. A single door was supplemented by a canvas roof which could provide an emergency exit. Production in Germany ended in 1958 but it continued in Ireland wheer about 8,000 cars wer built before the tooling and rights moved to Trojan in the UK. The model is an example of one of the last built at Trojan. At first sight this model appears lovely and I am sure that it will grace lots of OO scale railway layouts and 1950s dioramas. My impression of the quality of the model started to fall as I opened the box. 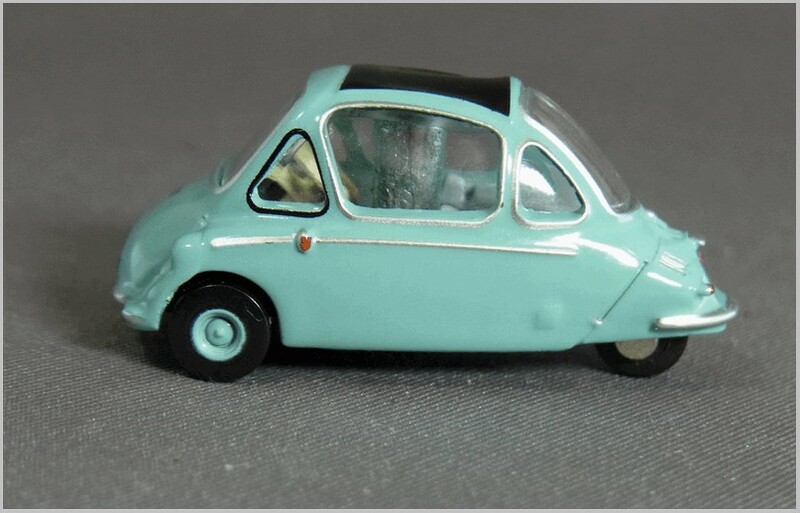 Yes, unlike the BMW Isetta, it is a real three wheeler which I could tell as the rear wheel and axle fell off into my hand when I had unscrewed it from the base. When I pushed it back in I noticed that the engine assembly it fitted into had not been glued in straight either. The steering wheel and fixed column are nicely done, though I think the steering wheel is over large. The front number plate also has characters which seem too small in height unlike the ones at the rear. Along the side on both the 1:!8 and 1:76 models is a totally unnecessary silver coach line which does not appear on the real car. The side mounted indicator is neatly moulded in and picked out. The wheels and tyres are single part items with painted on tyres. They replicate the real thing well. If you look carefully at the photograph above you can see the fixing of the shell to a base using a huge unpainted metal pillar in the same way that the Isetta was fixed. This is a crude and unnecessary engineering solution in this day and age, and it completely spoils the interior needing a blob to be fitted to surround pillar and to represent the interior which therefore lacks proper front and rear seats. The nicely shaped sunroof would have benefited from being painted in a matt paint which would have enhanced the fabric effect. The window frame printing is strange. The real car and the 1:18 scale model both have black window rims on doors, side and rear. But the 1:76 scale model has silver window surrounds everywhere but the front quarter which looks strange. At the front the model is tidy except for the headlights which are too flat and this is accentuated by the simple silver circle printed. Perhaps white lenses as used by some US firms would improve this. Apart from the crooked mounted engine and rear wheel not much to criticise here. Nice level of detail for the model’s size. 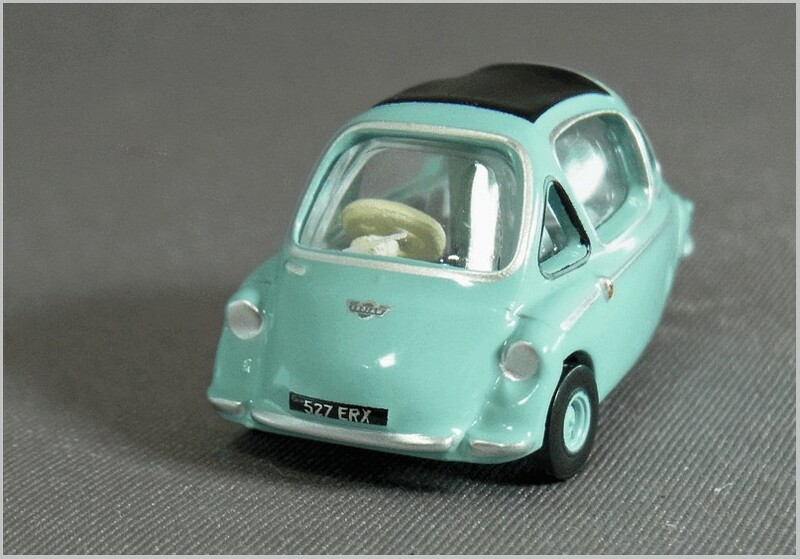 Again, like the recent Isetta, a potentially lovely model spoilt by some of the detailing, the crude construction, and the poor quality of part fitment. A shame because even with all the criticisms I have it still looks lovely as long as viewed from a few feet away.